China's richest man, Wang Jianlin, bought his son, Wang Sicong, a dog. If only this were where the story ended; a nice tale of a father and son bonding over their mutual love of a dark-eyed Husky and all the joy he brings them. But no. Wang Sicong, in all his infinite wisdom and disposable funds, has bought his dog, Wang Coco, two gold Apple Watches. 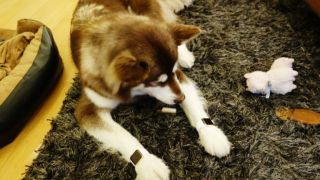 Not content to let Wang Coco enjoy his stereo Apple Watches in the privacy of his own home, Wang Sicong then posted pictures on the dog's dedicated Weibo account (terrible) with captions written as if the dog was writing them himself (THE WORST). "Look at my new watches. I was supposed to wear four of them as I have four feet," he, a human person, wrote as his dog, a dog, who has clearly failed to grasp how watches work. "But later I decided not to for fear I would appear too much of a flaunter. I really cannot settle for any less or it would be beneath me." On the plus side: today we get to post pictures of a dog.